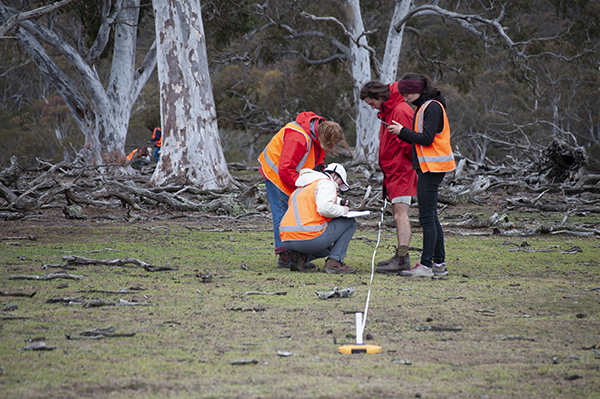 Thirty Environmental Science students from the Australian National University visited Mulloon Creek Natural Farms in September 2018 on their annual Environmental Field School visit, with Dr David Freudenberger (ANU) and TMI Research Coordinator Luke Peel. Day One was devoted to practical field educational and training activities, including Landscape Function Analysis and Ephemeral Drainage-line Assessments. Day Two involved soil sampling, profiles, infiltration, and morphological processes, and on Day Three students installed brush packs on scalded and eroded areas, with LFA monitoring conducted before and after installation. The Mulloon Institute is proud to have an ongoing relationship with the ANU that stretches back over 30 years, with students visiting each year or undertaking studies, under the supervision of Dr John Field, Emeritus Professor Stephen Dovers and Dr David Freudenberger who all serve on our Science Advisory Council.